(Apologies for the delay in posting due to major investigation, Safe Journalism resource development and Media Freedom work behind the scenes. 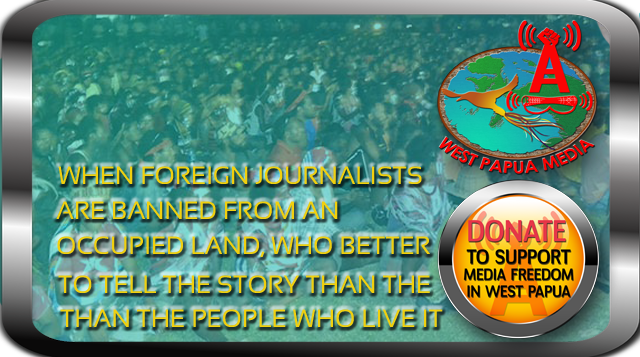 As WestPapuaMedia transforms into a long form investigative journalism, Analysis, Op-Ed, and of course media safety/freedom support model into 2016, Daily news will continue to be delivered by our partners at Tabloid Jubi’s West Papua Daily. Our Sidebar (scroll down at right) provides links to West Papua Daily’s content. A selection of our partner’s highlights will be reblogged here as usual). Jayapura, Jubi/BenarNews – During his visit the United States this week to attract more investment, President Joko Widodo, his ministers and officials in the field of economy were scheduled to officially meet with executives of US companies. However, Indonesian Minister of Foreign Affairs, Retno L.P. Marsudi denied the president would meet representatives from Freeport, which has an interest in obtaining a contract extension after 2021. “Rumours in media that the president had a schedule to have breakfast with Freeport are not true,” said Retno was quoted in Solopos. The US Company that operates the world’s largest gold mine and third largest copper mine in Papua, is enforcing the Indonesian Government to extend their Contract of Work while refer to the Indonesian regulation the extension could be approved two years prior the last contract was terminated. However, before his departure to the US, Jokowi gave a signal to Freeport could obtain the extension after the end of contract, it means in 2019. In between the crowded debates and controversy about the contract extension for PT. Freeport Indonesia (PTFI) in Mimika, the voices from Papua are rarely heard. But for Papuans, this issue of contract extension is not only a matter of time. The Papua Governor Lukas Enembe was doubt the intention of PTFI to develop Papua. “We submitted 17 points of Government’s Proposal consist of 11 points of Papua Government and 6 points of the Central Government in order to renegotiate with Freeport, including the Freeport’s involvement to build infrastructure in Papua, the increment of royalty and tax payment to the Provincial Government, share divestment, environmental issue and prioritizing Papuans to be employees. That’s our priorities,” Enembe told BeritaBenar on 17 October 2015. He accused Freeport to have no intention to Papua’s development. He took Timika City as an example, that until now the city is lacking of feasible infrastructures. “Freeport has been operating since 1967, but what about Timika and how’s Papuan condition right now? Infrastructures in Timika are still underdeveloped. The number of indigenous Papuan workers in Freeport is not equal with the number of non-Papuan workers. If it continues like this, Freeport is better leaving. Without it, Papuans will still survive,” said the Governor Enembe. The local authority estimates there are only 30 percent of the company’s employees are Papuans, while the rest are recruited from outside of Papua. Further Enembe refers to the attitude of PTFI that according to him hindering the water surface tax payment. Each year, Freeport should pay 360 billion rupiahs for the water surface tax, but the fact is up to now PTFI only paid approximately 1.5 billion for each year. “Freeport took many advantages of the government’s rotation every five years, and violated the commitment made between the government and Freeport. And the government just ignored this fact. But it is clear, Freeport has to pay 360 billion rupiahs each year,” he said. The Governor Enembe said the Provincial Government also support the policy taken by the Mimika Regional Government charging PTFI to pay a penalty amounted USD 3.6 billion or Rp 481 trillion to the indigenous tribes living in the surrounded mining area. “It’s the people’s demand because Freeport has exploited the mountain and its materials since being operated, but never given the in kind benefits to the local community,” said Enembe. Musa Sombuk, Lecturer at Papua State University and doctoral candidate at Australia National Univrsity thought the tax issue, profit sharing, and other issues that endured for years as consequences of PTFI’s contract of work is a “political agreement” rather an economic agreement between the company and the Indonesian Government. “At first time doing operation, it was clear that Indonesia need a cash. Now, the Freeport’s contract is not transparent, unequal and the profit sharing is not fair. Freeport also did any means in order to gain land ownership,” said Sombuk. When confirmed by BeritaBenar, PTFI spokesperson Riza Pratama declined to give comments on the renegotiation process with the Central Government, but he denied PTFI did the cunning ways in obtaining the land. He said the customary community at the PTFI mining area has gave their permission and tenure rights since PTFI started their operation for the first time. According to Reza, the company also has paid the penalty and is continuing the development program for indigenous communities at the surrounded the mining area. Sombuk, who admitted his involvement in the audit of PTFI in 1997, said the company is not only taking the copper and gold, but also the tailing –sand waste containing the iron ore, that could reach 30 billion tons. Several grams of tailings, according to him, could result 1 gram of 23 carat gold. “Now there’s 30 billion tons of tailing and it must be gold-contained. Where will the gold from tailing go?” said Sombuk. “Just imagine, Freeport should use the dump truck to dispose the tailing, but they just drain it to the Ajikwa River that is bearing the risk and impact to the people’s health and environment,” said Sombuk. According to Sombuk, PTFI could survive until now because it gained support and facilities from the government, both regional and provincial. The vague regulation and the attitude of both government and company for not being transparent making the law enforcement is risk with the corrupt practice. Sorong, Jubi – Residents in Salfi Sub-district of Sorong South Regency rejected the local government’s plan to invite a palm oil plantation company to their area, said Customary Council community leaders. “We absolutely reject it, because it would affect to the sustainability of our dense forest,” the Secretary of Sekanoi Customary Council Simson Sremere said. He further said the palm oil plantation would threat and damage the forest sustainability in their customary area. “In addition, the deforestation for the palm oil plantation could threaten the habitat of various animals in our forest,” he said. The presence of a palm oil company could have an adverse effect on the local economy and marginalise the local community as the company would tend to hire migrant employees. The Merauke Regency is experiencing a rapid rate of forest degradation and loss. This is illustrated by Merauke Regency’s contribution to total emissons1 in the province of Papua which is 45.29%. Merauke’s contribution to Indonesia’s national emissions is 3.6%. Tangke Mangi, who is the Merauke Bupati’s Expert Staff for Economy and Finance, said that a high emissions rate resulted from forest degradation and loss in Merauke. The extent of forest cover in Merauke Regency is 2.12 million hectares, compared with 22.25 million hectares of forest cover and 3.084 million hectares of scrubland in Papua [province] as a whole. “Merauke Regency as part of Indonesia, has already been assigned as an area for low-carbon development in Papua Province. So we have to swiftly follow up this initiative by compiling a Regency-level Strategic Action Plan (SRAK), he said in a workshop presenting the idea of the SRAK in Cafe Bellafiesta yesterday. It has been mentioned that Merauke’s emissions are a result of forest degradation and loss, which means they are caused by exploitation on the part of several corporate investors that are involved in the MIFEE program. “We can understand that this is happening because of the MIFEE program, so we need to balance it with the right mitigation actions. That way there can be a balance between economic development and environmental conservation”, he said. He made it clear that several actions that are already taking place can be synchronised with a mitigation program such as participative mapping of important places for indigenous communities, as is outlined in Merauke Regency’s land-use plan (RTRW) “The people need to be give space and places so they can take care of their sacred sites as well as the important places which are sources of the indigenous community’s everyday livelihood needs”, he added. Additionally the national commitment to reduce emissions by 41 percent is supported by Papua province which has been putting together a strategic action plan for the whole province. This will then be implemented by all development sectors in Papua, creating three zones of green economy and low-carbon development.